Happy 3rd Birthday, Harry’s Pizzeria! Lots of faces, tons of fun. Hard work to get ‘er done. Look back and peer ahead. Your pizza dreams soon divined. 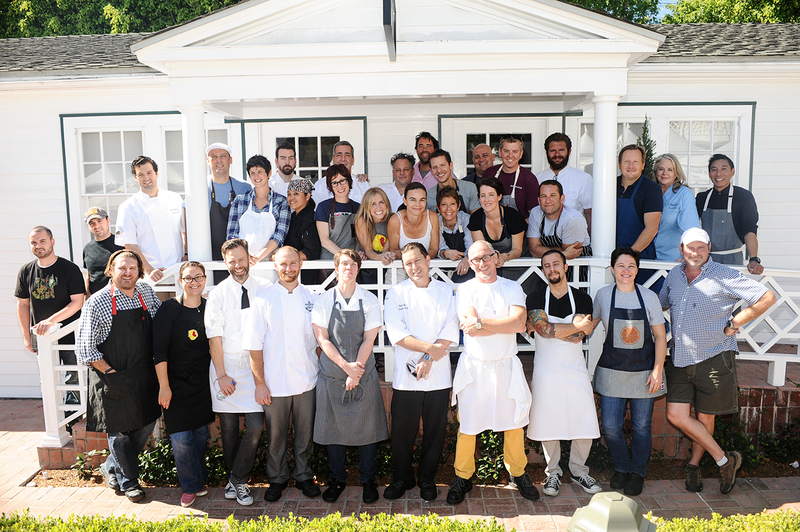 Thank you to Chef and everyone who has lent their talent to make our house a home over these past 3 years! Please enjoy a fully immersive ingredient experience in the restaurant today (especially GM Michael Kump’s truly spellbinding chalk art!) Wish the restaurant (your server) a happy birthday and a glass of prosecco is on the house! Cheers from the whole Harry’s and #TGHG teams — past, present and future. It’s almost time for Royal Caribbean’s Quantum of the Seas to set sail, so before The Genuine Hospitality Group team heads to Bremerhaven, Germany to train a new crew of genuine staff, we’re inviting you into the process here as we count down the days (23!) with a virtual tour of our menu. View Part I | Snacks here and all Michael’s Genuine Pub coverage here. 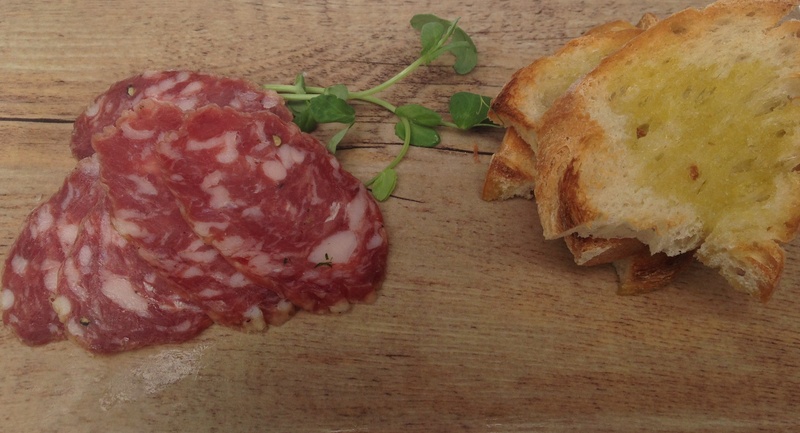 Today we continue with food and the delicious middle of the front of menu, Charcuterie & Cheese. We chose to work exclusively with La Quercia for their amazing artisan cured meats using only the best ingredients, produced responsibly, and hand-crafted in Iowa. Speck Americano: Speck is made using a boneless rear leg of pork that is smoked with applewood for a smoky aroma and flavor, then aged 9-10 months. The breeds of hog used are Duroc or Berkshire crossed on Lancaster from Heritage Acres or Niman Ranch. Order a Brooklyn Lager from the Pub draft while you are at it. Lomo Americano: Boneless pork loin aged for 3-6 months in Sea Salt, Pimenton de la Vera, and Cocoa for a rich, meaty, subtle, and light smoky flavor. Breeds are generally Tamworth or Berkshire crossed on Lancaster / Duroc / Berkshire cross. Pigs are raised by Heritage Acres. Aged 3-6 Months. Enjoy with Lua Rossa No. 2! Borsellino Salami: A salami made of pork ground with some sea salt and celery and aged for 2 months. The flavor is mild and meaty with a touch of fennel. Breeding is mixed, generally Duroc or Berkshire crossed on Lancaster from Heritage Acres or Niman Ranch. A light, rich white wine like Au Bon Climat’s Santa Barbara Chardonnay would be great here. Landaff: A semi-firm, pasteurized and cave-aged cow’s milk cheese that is tangy with a clean, buttery finish. Jasper Hill is a working dairy farm with an on-site creamery in the Northeast Kingdom of Vermont. An underground aging facility maximizes the potential of cheeses made by the creamery, as well as those made by other local producers. Leftover whey from the cheesemaking process is fed to heritage breed pigs, roaming the woodlands beyond the cows’ pasture. Really proud to have this cheese onboard, as it’s a regular at The Cypress Room making The Cypress Burger sing! Midnight Moon: A semi-soft goat’s milk cheese that is aged for six months resulting in an ivory-colored cheese is dense and smooth with a nutty and brown butter flavor up front and a long caramel finish. Goat milk is sourced from Cypress Grove’s California farm, and the cheese is made in Holland exclusively for them. You may also recognize this creamery’s flagship cheese and one of my personal favorites, Humbolt fog! 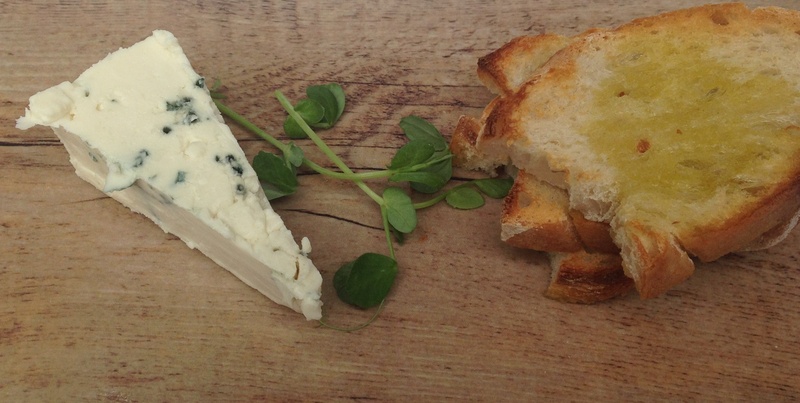 Point Reyes: A blue cheese made from raw cow’s milk from California and aged for 6 months. This cheese has a creamy texture with layers of full sweet flavor with a medium blue cheese tang. It’s kosher and gluten free! In 1904, Great Grandfather Tobias Giacomini left Northern Italy and landed in Northern California with a dream of raising chickens and cows. The Point Reyes Farmstead Cheese Company is just one of those great American family stories, and we are proud to bring their product to our Royal Caribbean family on Quantum of the Seas. The Pub Board: An assortment of cured meats & cheeses served with sourdough bread, cornichons & accompaniments including frisee, Dijon mustard, crostini. 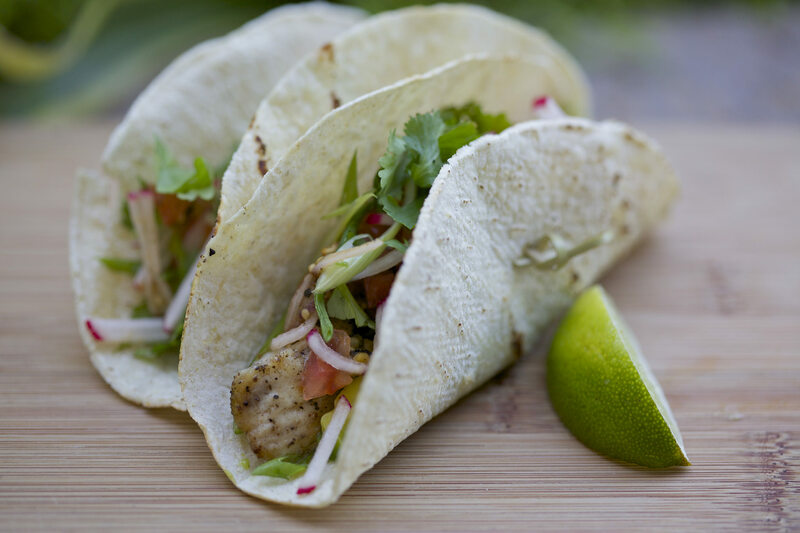 Eat them to beat them: Grilled lionfish tacos shot on site, and devoured shortly after by yours truly outside Michael’s Genuine Food & Drink Grand Cayman. Our friends at Monterey Bay Aquarium’s Seafood Watch are uniting their Blue Ribbon Task Force chefs including Michael around National Taco Day (October 4) and National Seafood Month (October) to raise awareness for sustainable seafood in the most delicious way possible. We most recently covered this topic hugely important the entire TGHG family on our blog with the release of Paul Greenberg’s most recent book, and now we’re back at it again inspired by my week in Grand Cayman, our home away from home where local fish and supporting the marine ecosystem is always top of mind. Small changes have big impact especially in such a small slice of the Caribbean environment — and we’re talking positive ones here, like the Department of Environment’s lionfish culling program. The first juvenile Indo-pacific Red Lionfish was removed from a dive site in Little Cayman in 2008 setting in motion a massive public-private partnership lead by DOE and bringing together local residents, dive industry operators, and people like TGHG Special Ops Chef Thomas Tennant in the unique position to influence change thanks to combining a love of SCUBA and skills in the kitchen. Eat them to beat them we say! During his 4 year tenure as our Grand Cayman opening chef, Thomas single handedly removed thousands (I wonder if not tens of thousands) of pounds of lionfish at his own spear, not to mention receiving countless deliveries from licensed divers through our service entrance sometimes on a daily basis. If that drop in the bucket doesn’t count for something on a larger scale, I don’t know what does. 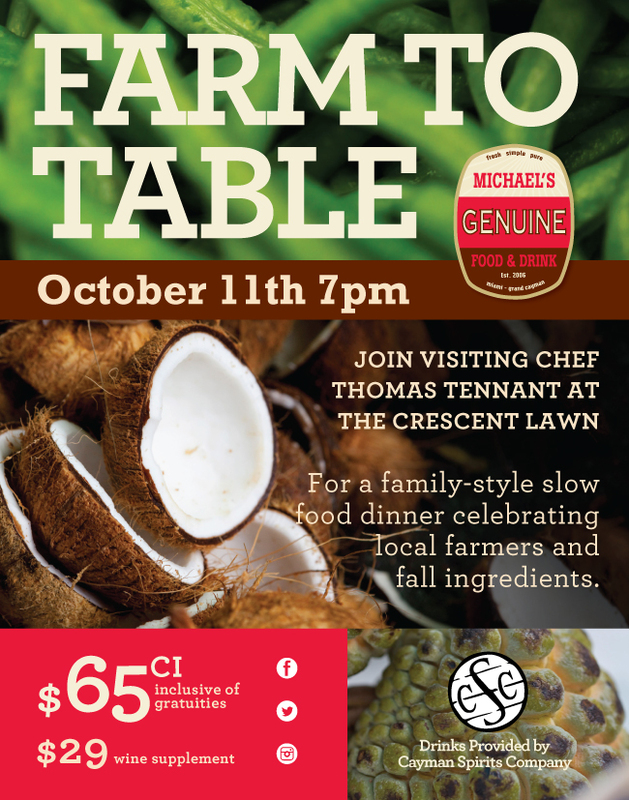 Thomas returns to the island to host our fall Farm to Table Dinner on October 11, but we’re not waiting for that, taco day, or seafood month to celebrate this legacy that lives on in its simplest and maybe most delicious form every Monday through Saturday during our Happy Hour in Grand Cayman… Grilled Lionfish Tacos! The recipe below is pretty awesome thanks to its simplicity. A few flavors combining into one juicy bite. The verdantly flecked herb mayo is especially addictive and you don’t need much. With so many of Sylvester’s foraged avocados on our food bar wall here to deplete, there should be plenty of these going out at Happy Hour. I know I will make my contribution known! 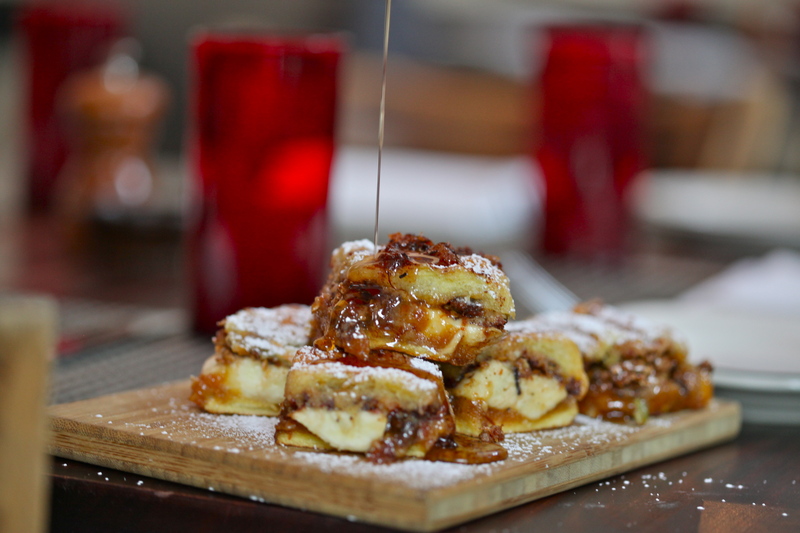 Follow both Genuine Instagrams (@MGFD_MIA and @MGFD_GCM) this week for a bigger taste of what’s new on-island. Today we’ll get the best temperature check of what’s in season when the Farmers Market makes its weekly Wednesday pop in our town center of Camana Bay. Very excited to poke around the stalls with chef de cuisine Prudent Baselais and enjoy some of the ingredients for lunch!